Modern gamers are spoiled for choice. The one downside of so many great titles being released every monty is that some great ones will inevitably slip your radar. Homeworld: Deserts of Kharak may have come from a cult-classic franchise, but this 2016 gem snuck by many. If you’ve already played a Homeworld game you’ll obviously love this one. If you missed the first two (like I did) and have a penchant for RTS sci-fi, you better take a look here. Deserts of Kharak nails the little things. The ambience of an RTS is underrated but very important. The sound clips heard from each unit need to be interesting but not irritating, as you’ll be hearing them a lot. Starcraft’s Zerg noises are forever burned into my brain. The Terran’s wild cowboy-esque dialogue lent a ton of personality to that race as well, and who could forget Warcraft’s hilarious quips? Kharak is much more serious than a ‘Craft and focuses on a realistic presentation that feels matter of fact. Like Ridley Scott’s Alien, the crew are made to sound like it’s just another day at work. 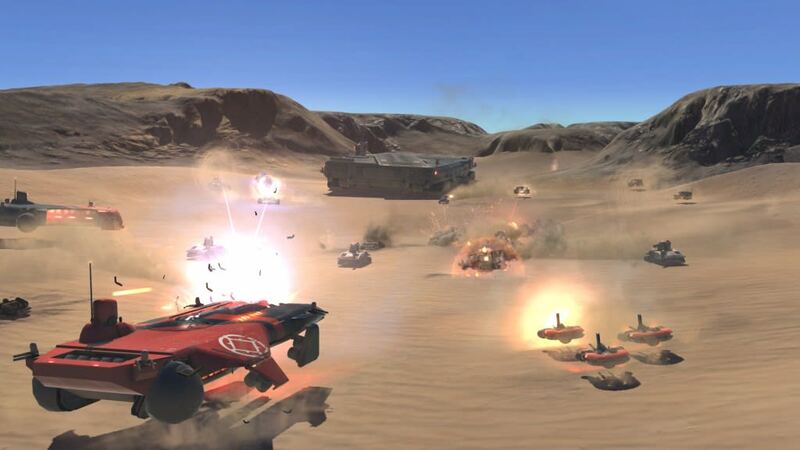 A fun feature of Kharak and Homeworld games is the mobile production unit. Nearly every RTS has some kind of main base for producing grunt workers, collecting, resources, and generally being ‘home’, but the Homeworld franchise uses a mobile command center to switch up the feel. This adds strategic elements but also contributes to the story and tone. I loved (2005) Battlestar Galactica’s story mechanic of placing the entire human race onto a few ships, running for survival of the species. Kharak doesn’t go as deep of course, but the surface still provides plenty of atmosphere. Contributing to the survival aspect, many losses incurred carry over through missions, helping you feel the impact of each encounter. There are a few grains of sand in the ointment of course. The modes are a bit limited outside of the excellent single-player campaign, and the individual desert setting can get monotonous. It’s also not very long, but if you happen to be reading in a timely fashion, you can snag it for only $16.49 CDN, which is a whopping -70% off the $55 regular price. Full price is reserved for Homeworld fans and those craving atmospheric RTS Sci-Fi so many years after it’s fallen out of fashion.